For many years artists have appreciated the qualities of the Langton. The paper is colour-stable, mould-made and acid-free. The best watercolour papers are acid-free to prevent the deterioration of paint and to preserve the integrity of the paper over time. Available in NOT and ROUGH. Available spiral bound (140lb, 12 sheets) or gummed (140lb, 12 sheets). 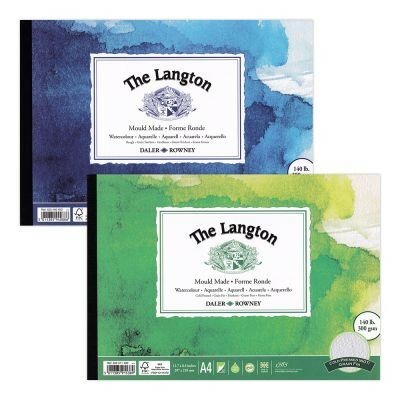 Good price and quality - Langton Pad Spiral Rough 12"x9"
Ideal size and paper quality - just what I was looking for. - Langton Pad Spiral NOT 7"x10"
Perfect for the job at the right price. - Langton Pad Spiral Rough 12"x9"